I’m not always the biggest fan of chicken fingers. They have to be just the right amount of crispy to meaty to spicy for me to really enjoy them. But they are the food I’m most likely to revert back to if I’m out to eat and can’t find anything else I like. They are one of those staple foods. Problem is, even when I’m really craving them and I know they will be just perfect, they aren’t ever really healthy or easy to make at home. I served mine up with my own cabbage salad creation. Great compliment! That’s where this recipe comes into play. It’s got a great crispness from the Rice Krispies coating and you can spice it up more or less depending on your preferences. The orange zest adds a really nice flavor without being overpowering. 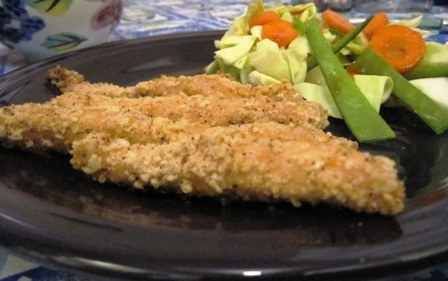 It’s also great that this dish was super easy to make and low calorie and fat as you bake them instead of fry. Can’t get much better than that. Fresh out of the oven and piping hot. 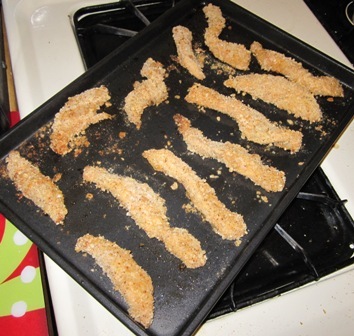 This is only about half of the chicken fingers I was able to make with this recipe. Put the cereal in a plastic storage bag and crush with a rolling pin or heavy can until coarsely crushed. In a shallow bowl combine the toasted sesame seeds, crushed cereal and orange zest and lightly season with salt and pepper. In a second shallow dish, beat the egg whites with the teriyaki sauce. Dip each chicken tender in the egg mixture and then the cereal mixture, pressing to coat well. Place on the rack and mist the chicken with nonstick cooking spray. Bake until the crust is golden and the chicken is cooked through, 18 to 20 minutes. Note: I did not make the dipping sauce and I created my own cabbage, snow pea, and carrot salad as opposed to the one listed with the recipe on the Food Network site. Therefore, my nutritional analysis is different from what theirs says.